I had already expended my lunch hour at home when I headed out my front door in the afternoon. Leaving through the front gate I turned left; the wrong direction if I wanted to head back to work. It was a crisp Autumn day that coolly prompted me to don a toque for the first time this season. My detour was purely a scenic one - on my way to work that morning I had glimpsed brightly coloured leaves in the distance and I wanted to get a closer look. The day before I had noticed the new snow on the mountains and I wanted to take it all in before spending the rest of my day in front of a computer. Just three blocks north of my home is Oak St. If you have ever been at the bottom of Oak St. then you know the area I am talking about. It is, no question, the steepest street block in the city. I distinctly remember the time when my sister, coaching me, in the early days when I was learning to drive a standard, to turn up and on to Oak St. I almost had a heart attack as I desperately motored the vehicle up that impossibly steep hill in the least elegant and most panicked manner possible. The literal upside of this steep hill is that just a few blocks up and you encounter a pretty stellar view of the city. Downtown is in the background, English bay sits in the middle littered with sail boats and the sea wall is visible passing through both edges of False Creek. This was not the primary view I was after on that afternoon however. I was in search of maple trees. As I neared Oak St., I happened upon two looming, tall and brilliant red-leafed maples. As I pulled my camera-phone out for a snapshot an older man walked towards me from across the street. We made eye contact and he smiled as he approached, deducing my directed aim to capture an eternal glimpse of the beautiful scarlet beings. "My favorite time of year", he said as he passed me. "So pretty!" I responded and he nodded in agreement as I plopped my phone back into my pocket and carried on to my Oak St. destination. Being someone who fled my home town, in the Canadian Prairies, to avoid ever having to be cold again, I have never considered Autumn to be my favorite season. But there is no denying that it has its highlights. Ruby red and blood orange maples, snow spattering on the stormy grey and blue mountains and rich, roasted squash-filled dishes are just a handful of the reasons I could never strongly dislike the fall. For a thanksgiving dinner hosted by a friend, I made these biscuits with squash. Roasted squash and sage are about as an Autumnal of a combination as you can make, and not many flavour combinations are quite so comforting. As you may know, I lost my new camera to a robber a couple of weeks ago. On a whim this weekend, I decided to upgrade my old school phone to an iPhone. I have spent the entire day playing around with Instagram and thought I could do some posts with my camera phone photos until I am able to replace my good camera. Toss squash slices with olive oil, sea salt, garlic and maple syrup. Lay out slices on a baking sheet on a sheet of parchment paper. Roast 20 minutes, flipping the slices once after about 10 minutes. Mix the flour, baking soda, baking powder and sea salt in a large bowl. Mix the chopped butter into the flour; cut the butter into the flour with a pastry knife or use your fingers to break the butter into smaller bits and to incorporate it into the flour. Mix in the sage and cheddar into the dry mixture. In a separate bowl, whisk together the yogurt, milk and honey. Next, add the wet mixture into the flour mixture. Stir until just incorporated. Turn the mixed dough out onto a heavily floured counter and flatten it into about a half inch thick round. 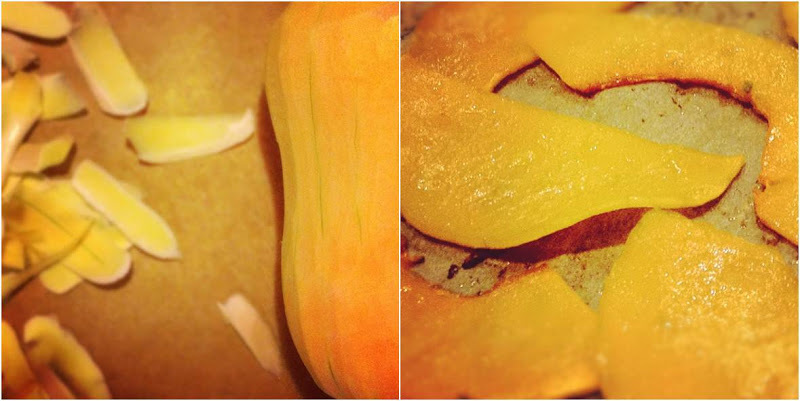 Lay about 6-8 slices of squash onto half of the dough, then cut the dough in half with a large sharp knife. Pick up half of the dough and put it on top of the other half of dough that has the squash on top; in essence sandwiching the squash between two layers of dough. Flatten the dough out again, pressing gently with your fingertips. Repeat steps 11-13 two more times, layering the squash, cutting and flattening. This does not have to be neat and tidy, it is okay if the squash peaks out of the sides of the dough. Once you have the 3 layers of squash in the dough, flatten out one final time and cookie-cutter out 2 or 3 inch diameter rounds from the dough. Place the biscuits onto a baking sheet. With the leftover scraps, I just formed 2 more, less pretty, biscuits by shaping the dough with my hands. Bake the biscuits about 12 minutes (turn the baking sheet 180 degrees after about 6 minutes for even cooking). Remove biscuits from oven and let cool. Herby squash biscuits sound like they'd be perfect with a massive pot of stew. Yay! I will be trying the biscuits. Glad I found your blog! A great article indeed and a very detailed, realistic and superb analysis, of this issue, very nice write up.